It is official! This Saturday, May 12th will be our first, annual "San Francisco Radio Club" SOTA activation. Tim AF6TF and I (Antonis) AA6PP will be leading this effort. We are planning to combine hiking and nature trailing with setting up radio stations (both VHF/UHF & HF) and making contacts! We will most likely lead two groups of hikers (novice and advanced) to the top of Mt Tamalpais West Peak on that Saturday morning. There is also parking up there so if you are not into hiking you can still participate (little walking will be required though). If you can't make it then you can be a chaser and help us out! [Read below for event details]. What is Summits on the Air (SOTA)? SOTA is an award scheme for radio amateurs that encourages portable operation in mountainous areas. SOTA has been carefully designed to make participation possible for all Radio Amateurs and Shortwave Listeners - this is not just for mountaineers! SOTA is fully operational in nearly a hundred countries across the world. Each country has its own Association which defines the recognised SOTA summits within that Association. Each summit earns the activators and chasers a score which is related to the height of the summit. Certificates are available for various scores, leading to the prestigious "Mountain Goat" and "Shack Sloth" trophies. ​Like anywhere else you have to be aware of the heat, ticks and mosquitoes. This is not a race to the top! We are going there to have fun! Group 1 will meet at Pantoll Ranger Station Parking lot. [for directions see link above]. You can park at Pantoll, requires an $8 ticket, have exact money and make sure you display the receipt on your car's window. If lucky, you can park opposite Pantoll for free! (there are 5-6 spots). Our meeting point will be near the Pantoll Ranger station. This location also has 3 toilets. At 8:30am we will start our hike to meet Group 2 at the Mountain Theatre parking lot named Quarry Parking Lot. To get there we will hike up the "Old Mine Trail" and turn right at the "Old Mine Spur trail" that leads to Mountain Theater. Then a short 0.1mile trail heading North gets us to the Quarry Parking Lot. Total distance 1.2 miles; ; this hike climbs from 1496 feet to 1968 feet elevation. Bring your cameras, the view if the weather cooperates will be spectacular. Group 2 will meet at the Quarry Parking lot. [for directions see link above]. There you will wait for Group 1 to arrive. Parking is free at this location. To get there you pass Pantoll, head towards Rocksprings and continue to Quarry. The nearest toilet to this location is at Mountain Theater, only 2 mins walk south. 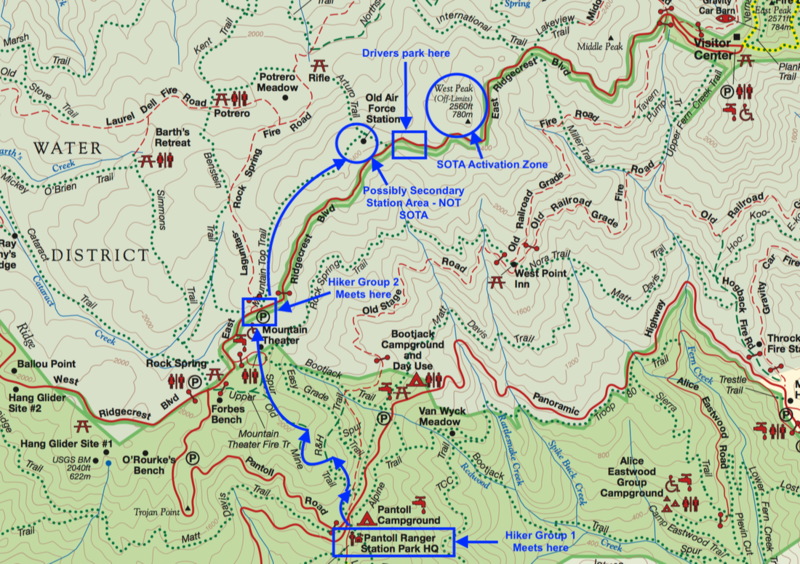 At 9:30am we will all hike to the West Point SOTA location (near the Air force Radar). To get there we will take the "Mountain Top Trail" which is roughly 0.6 miles to the Old (abandoned) Air Force station. I love this location and I am considering setting a station up there even if its outside the SOTA activation zone. We will then walk another 0.2 miles to the entrance of the Air Force Station to meet group 3, the folks who will drive directly there. Group 3 will meet at the entrance of the Old Air Force station. The link to the location is above. The hikers will meet you there around 10:15am. We will then walk all together to the activation location which is 0.2-0.3 miles away. The nearest toilet to the SOTA summit is at the old Air Force Station ruins. Lets have fun and remember; Care for the environment is our #1 rule! The Activator must hold an appropriate transmitting licence. Operations must not be in, or in the close vicinity of, a motor vehicle. No part of the station may be connected in any way with the motor vehicle. The Operating Position must be within the Activation Zone. The operating position must lie within a closed contour line at the permitted maximum Vertical Distance below the summit. (Typically the contour line is 25 metres below peak height of the summit). All equipment must be operated from a portable power source (batteries, solar cells, etc). At least one QSO must be made from the Summit to qualify it as an activation. In order for the activation to qualify for the points attributed to that Summit, a minimum of four QSOs must be made, each of which must be with a different station. QSOs must comprise an exchange of callsigns and signal reports, it is strongly recommended that the summit identifier be given during each contact. In our case W6/CC-063. QSOs with others within the same Activation Zone do not count towards the QSO total. QSOs via terrestrial repeaters do not count towards the QSO total. Activators must not cause any damage to the environment. Activators must not cause any damage to the environment. This includes damage to the mountain itself, walls, fences, livestock, buildings, etc. Any Activator who is found to have deliberately or carelessly caused such damage may be, at the Programme Management Team's discretion, excluded from the programme. Activators are required to operate in a manner that is in keeping with the spirit of the Programme. Activators must operate with due consideration for other people on the hills. Excessive noise, inconsiderate siting of equipment and antennas, etc. is not acceptable and potentially brings the Programme into disrepute. Evidence of such behaviour may result, at the Programme Management Team's discretion, in exclusion from the programme.